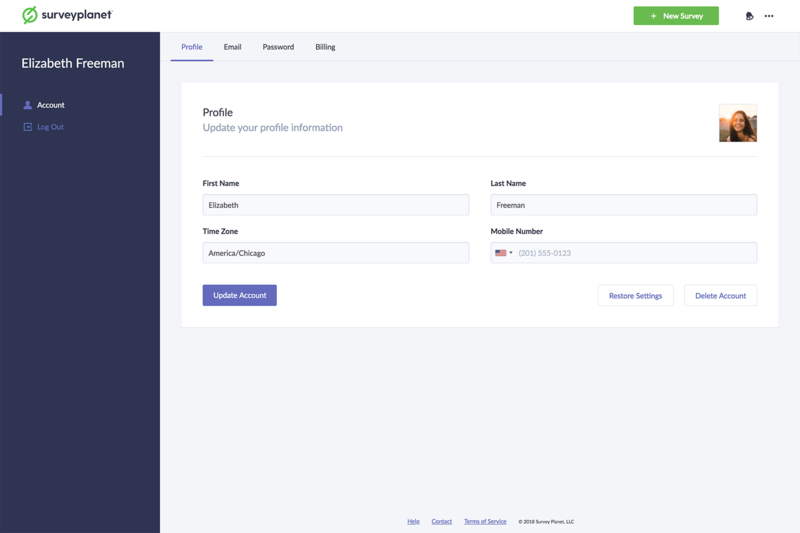 All your account information is in one place. Once you log in to your account, click on the Menu icon in the top right corner to go to your account information. If you click on the Account icon , you are taken to your Profile. From here, you can choose from the following tabs at the top: Email, Password and Billing. Once you make any changes, click Update Account. *You can also delete your account from this page using the *Delete Account button or restore original settings by using the Restore Settings button. Click on the Account icon . Here you can update your First Name, Last Name, your Time Zone and Mobile Number. Click Update Account to apply. To restore SurveyPlanet to its default settings, click on the Account icon and then click the Profile tab. Click the Restore Settings button at the bottom. Clicking this button will restore SurveyPlanet's default tooltip, warning and view settings. To change your email address, click on the Account icon and then click the Email tab at the top of the page. You can then enter the email address you want to use and click Update Email. To change your password, click on the Account icon and then click the Password tab at the top of the page. 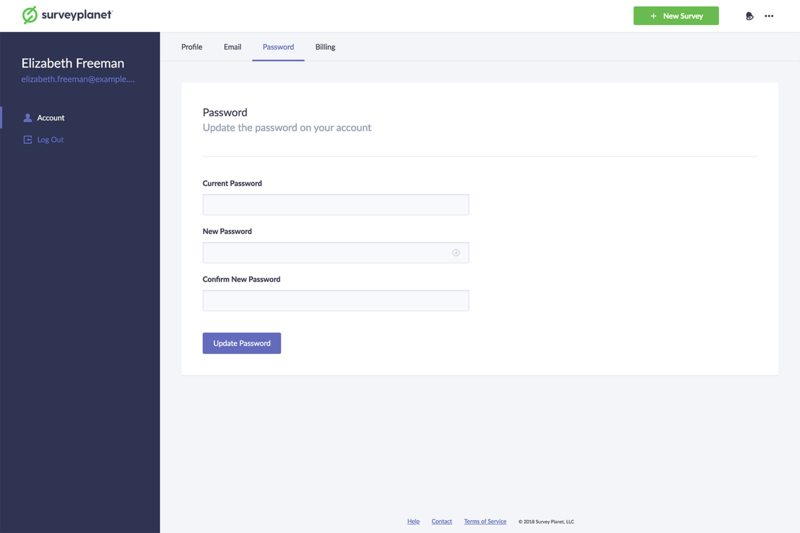 Type your current password in the Current Password input field. Type your new password in the New Password input field, and then retype your new password in the Confirm New Password input field. Passwords must be at least 8 characters. Click Update Password. To delete your account, click on the Account icon and then click the Profile tab. Then in the bottom right corner, click the Delete Account button. This will ask you to enter your email address to confirm. Note: Deleting your account is permanent and you will lose all associated surveys and results.